Thank you for the lovely gift. Little Robert loved it. 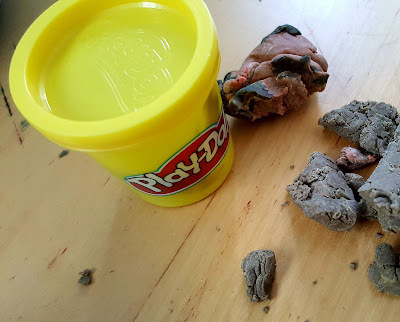 No, we haven't had Playdoh before - I guess I always thought they were too young to appreciate it. But I must admit: I was wrong. They've been having such fun with it, all the wonderful colours and those cute little cutting and shaping tools! I especially love the little pizza-making set! What fun! Yes, they still have a bunch of different colours. Why? Isn't that the way it's supposed to be? When they're finished with it, they just put it back in the appropriate pot. Or am I missing something here? Yes, today was the day they discovered you can lump all of the colours together and make one big gigantic ball of Playdoh ! What excitement! And guess what - when you mash a bunch of beautiful, vivid Playdoh colours all together, do you know what you get? Something that resembles a giant turd, that's what! Apparently, this is the primal scream of colour theory: squished together, all colours just band together to become the ugliest colour there is. Fascinating, but educational at the same time. This is a gift that just keeps giving. 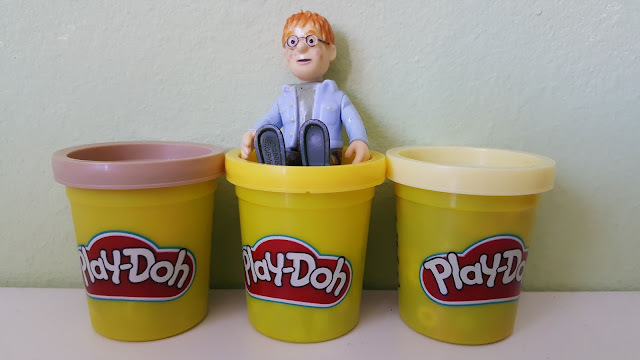 Did you know that Playdoh hardens when it's not returned into its cute little colour-coded pots? Now that we only have one colour (Turd), it can't go back into the appropriate pot - according to the logic of my three-year-old - so it has to STAY OUTSIDE. Interestingly, it has not only hardened, but separated into a large number of smaller little balls. I think the colours are trying to regroup. In any case, the little balls have also taken flight and they're everywhere - under the bed, on the carpet, I even found one in my bra. It's like living with a herd of grazing sheep that are leaving their droppings everywhere. Goodness, it's hard to clean up, that stuff. But, anyway, this is the price we pay when we encourage our children to play creatively, isn't it? The flipping Playdoh is everywhere. Does it multiply or expand or join forces with other crap to make baby Playdohs? Does it just look bigger because it's sucked up every bit of fluff and dust on its travels across the floor and under the sofa? Seriously, this stuff should come with a warning. I'm off to pick it out of the bed linen. Why do you hate me? Why? What did I ever do to you? You know what your children are getting for Christmas, don't you? I never set out to write a parenting blog. 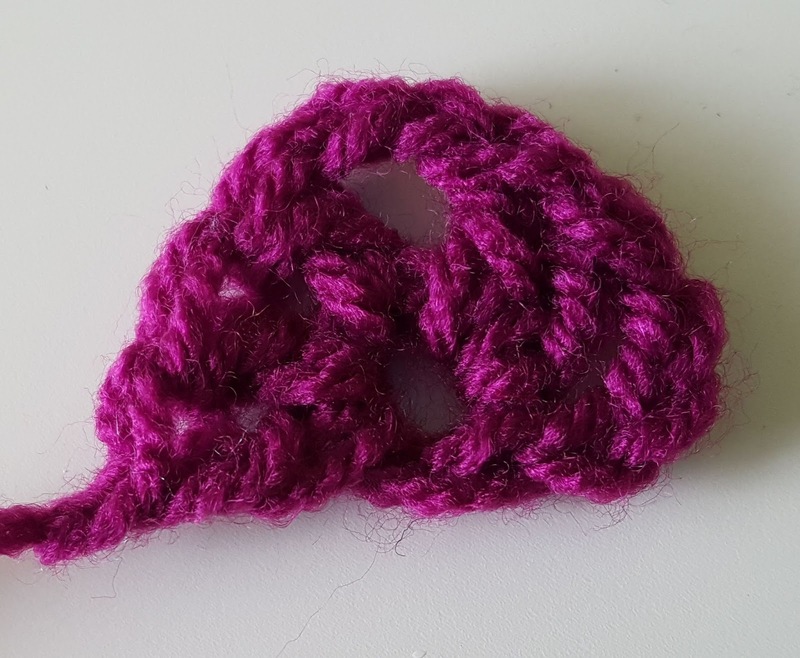 In fact, it's the last thing I want to do - writing this blog is all about NOT being a parent, it's about doing things without a child on my knee, under my feet or in my hair (and, no, I don't mean that metaphorically.) Sometimes, though, my attempts to be something other than Mama - which is who I am 99.99% of the day, as it's the first word I hear when I wake, the last word I hear when I go to sleep and a word I hear far too often when I actually should be asleep - just don't succeed because being Mama has given me some very interesting perspectives on life. How do you explain dreams to someone who has never realised that everyone dreams, for example? My three-year-old confided in me one day that he "sees ideas with his eyes closed" - and he was astounded that I also see ideas when my eyes are closed and, in fact everyone does. Imagine: I got to see the moment when a little person realised what a dream was. Isn't that great? I don't know if it's blogworthy, but it made my day. And this is what happens with children. In the midst of the madness, the lunacy, the incessant talking about all kinds of stuff that seems entirely random and disconnected and sometimes very head-wrecking, there are some moments of startling lucidity and astonishing beauty. Like, for example, the day my four-year-old son came home from kindergarten and told me about the robot. His name was Surtee and he was always at the window looking at the children. (Now, this is the edited version. What he actually said was something like this: "...And then Anna said I could share her apple and I said I only like red apples and her Mama gives her only green apples and then I said I don't like green apples and then she took her green apple and she wanted to have my red apple and then I saw a robot in the window and his name is Surtee and Anna doesn't want any more green apples because she wants red apples and he watches the children going to the playground sometimes..."
I shook my head, to dislodge any Lego bricks the little perishers might have stuck in my ears and repeated, "Surtee?" "Yes," he said, already bored of the topic. I saw he was ready to launch into another analysis of the contents of Anna's snack box so I said quickly, "And he looks at the children going to the playground?" "Yes," he said with martyred patience. "He stands like this." And he pressed his arms by his sides, sticking his hands out like little flaps. He nodded firmly. "He's lonely," he said sadly. "Surtee is a lonely robot?" I said. "But where does he live? Is he a real robot or a pretend robot? When did you see him?" - but he just wriggled out of my arms and went off to find his little brother to concoct new ways to flood the bathroom. Concerned, naturally, that children at the playground were being spied upon by some creep in a window, I spoke to my husband about it and we tried to figure out what the child was talking about. Our son repeated what he'd told me: his name was Surtee. 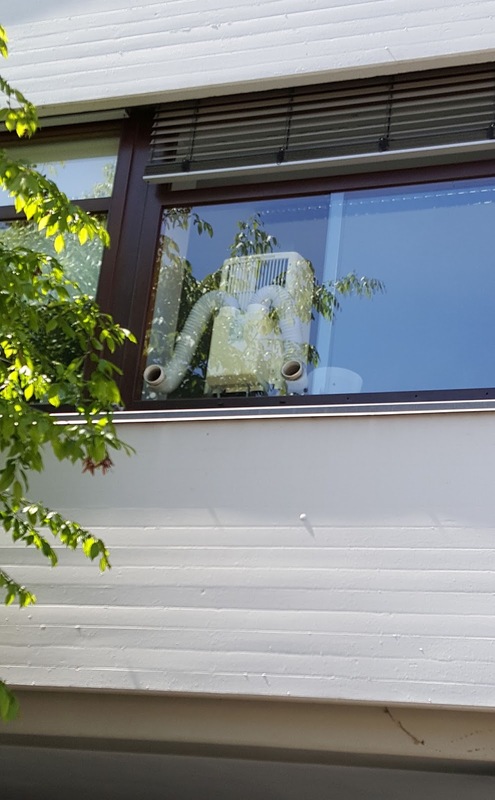 He looked out the window at the children going to the playground and he stood like this - cue little flappy arms and our son's best impression of a lonely robot's face. "Will you point him out the next time you see him?" I asked and he nodded. I put him down off my knee and he went back to play, probably regretting he ever mentioned Surtee to his weird parents (does not bode well for his teenage years). So for days afterwards, on the way to kindergarten, I asked about Surtee. Was that Surtee? Where does Surtee live? Had he seen him again? And I got nothing but 'No' or shrugs. Weeks passed, the weather turned colder, and one day the blinds on office block overlooking the road to the playground were pulled up, to let in the weak autumn sunshine. "There he is!" my son shouted, pointing up at the window. "There's Surtee!" Now we wave at Surtee every day. He hasn't waved back yet, mind you, but I like to think he feels a little bit less lonely. Special thanks to Katie K and Tammy for their comments - so nice to hear from you, it's like meeting old friends once again. [[Robot hugs]] to you both. Aunt:"So it's just a little get-together for Ciara's communion. Nothing fancy, now." Mother: "Well, we'll have to make a little fuss of her on her big day." Aunt: "Yes, but really: no fuss, now. No need for everyone to get all dressed up." Mother: "And what should I bring?" Aunt: "Hmmm. We don't really need anything..."
Mother: "Oh, come on! I have to bring something!" Aunt: "Maybe you could make a bit of potato salad? Just a bit, though. There'll be loads of food." Now, in case you don't come from a large family (and it doesn't even have to be an Irish one, because I know for a fact that this is how it works in Italian, Polish and Nigerian families as well, probably in other cultures, too, but my research has been limited), let me just tell you one thing: with the exception of the statement that there will be loads of food, everything else in this exchange is lies. Pure lies. It will be fancy (even as my mother is hanging up the phone, the Host Auntie is probably shrieking at her offspring to go and count the Good Tablecloths NOW and if one of her little perishers has left a mark on them with felt-tip pen, there will be HELL to pay), people will be dressed up (and my mother at this point is usually torn between fretting about her potato salad and how she will make nine kids presentable before Saturday) and yes, you DO need to bring something. You can't arrive with your hands swinging, God forbid. Because the worst thing - take a minute to brace yourself - the very worst thing that could happen at one of these Occasions is that you might run out of food. I don't think it has every actually happened in Ireland, except perhaps during the Great Famine of 1845-1847, but there is a morbid fear that a guest might leave your home feeling, say, peckish. Or that a guest might want something like, for example, a piece of apple pie but you only have rhubarb, blackberry, peach or raspberry. Or (and any self-respecting Irish materfamilias will get the heebie-jeebies at the mere thought) someone might say, "Gosh, I was at so-and-so's house and they were fierce mean with the food." If someone rings you the day after your party and reveals that they spent the night on the floor in the throes of gluttony-induced indigestion, you can rest assured that your party was a success. So fast-forward a few days: the potato salad is finished. Sure, it only took a full day and an entire workforce comprised of your plentiful children, but a vessel deemed sufficiently big (a bucket or a baby bath or a trough) is now filled with the kind of potato salad you'd never be bothered dishing up to your own family - Posh Potato Salad, the kind that has salt AND pepper and is garnished with parsley. Parsley! Oh, the fanciness of it! The night before the big event, children are bathed and clothes laid out. Sometimes they even match. Socks are clean, shoes are polished, hairs are washed. After all, no one wants to turn up with a shower of ragamuffins, do they? No, we are told, they do not. This is what we hear repeatedly as my hair-brush wielding mother batters our scalps while simultaneously separating squabbling toddlers with her foot. We don't really mind, because we all know that Occasions like this mean two things: unparalleled access to sweeties and dozens and dozens of cousins. I have over seventy first cousins. (Yes, you may read that again if you wish.) We keep adding them up but someone is always left out, so we're not sure about the exact number. I think it's 74 - but, honestly, I've lost track. Clearly, getting all of us together in the one place is nigh-on impossible, but family occasions like these always provided us with an opportunity to re-connect. We'd arrive in our best threads, hang around our parents shyly for a couple of minutes, then take off down the garden to join the army of little children engaged in a high-octane information exchange: who's who, who knows what dangerous stuff can be done, who knows the most naughty words. Within minutes the children turn feral, whooping and shrieking, scaling walls and trees and crawling into places far too small or dangerous for little people. There are always calamities, a yowling child makes his/her way down the garden at regular intervals: pushed, knocked down, fell over, tripped up or over. Adding to the injury was the insult of not being able to find your mother: you'd have to look hard in the pack of similar-looking women, trying to locate your Ma (hint: usually the one ignoring you). As a family, we tend to re-use and recycle many of the same names, particularly the boys' names, so there are about 23 Johns and 15 Michaels. When a wailing child enters the kitchen, the grown-ups often have to establish whose it is: Baby John? Small John? Big John? Curly John? Red John? Blond John? "Is that mine or yours?" someone might say, trying to identify the child from the pitch of its howl. "Mine," comes the grim answer and someone places a snotty child in its mother's arms. After a garbled rendition of the Story of Woe, which always involves immense wrong-doing and paints the injured party in a near-martyr-like light, the mother would have to wipe the child's face, then administer a restorative cookie or bag of gummi bears, before marching down the path to make loud threatening noises at an empty garden. When children hear the heavy tread of a mother on the warpath, they have the ability to melt away into the trees and disappear, but the mother can't lose face, so she shakes a fist at a bunch of bushes and threatens blue murder. As soon as she goes stomping back into the house, the children reappear from behind trees and under bushes and the games continue as though nothing ever happened. While the children are forming alliances and planning all kinds of derring-do, the Aunties have now all gathered in the kitchen. They are, in fact, in their Best Clothes, but that doesn't stop them from jostling to get at the sink, where one (usually my Aunt Dell) will wash up the constant stream of dirty dishes, two will dry up and seven stand around and supply a constant stream of "news" (gossip). It's only a matter of time before the very small kitchen becomes jam-packed with bodies: at some point everyone realises that the best conversations are happening there, so the living room (where the table is decked out in a Good Tablecloth free of felt-tip pen) is left to the elderly and those who don't have the stomach (and strong elbows) to wedge themselves into the melee in the kitchen. Some of the fathers might be trying to get in on the fun, but most of them will have found a place to gather in the garden where they can talk and smoke in peace, oblivious to the antics of the children (who, at this stage, could be assembling homemade fireworks, making a sleigh for the family dog to pull or teaching the toddlers how to drive a car). This is an odd aspect of Irish society that I think was possibly Ireland's version of feminism in the 1980s: The Eejitry of Men. It was a commonly-held belief that all men are bumbling oafs - God only knows what they would get up to if it weren't for their wives. Leave them to their own devices and you'd have a Neanderthal in a matter of days. And back then, it simply wasn't The Done Thing to praise your husband or even compliment him in his absence, much less his presence (ugh - get a room! ), in fact you were expected to be a martyr to his Eejitry. You could try to outdo the other women with tales of your husband's Eejitry, e.g. "My lad is a terrible eejit. There he was this morning, putting Michael's shoes on John - what's he like? Michael's shoes are black, not blue!!" "In fairness, though, he did brush the kids' hair this morning." God forbid you might agree - even accidentally - with someone's condemnation of their other half. Imagine if someone was mid-rant at the Eejitry of their husband and someone else nodded absent-mindedly in a way that might suggest that they agreed!!! The cheek! Because it's all very well to bemoan your own husband's Eejitry, but you are honour-bound to assure your sisters and sisters-in-law that their specimen is, in fact, a gem among men. An unconcentrated nod at the wrong time during a narrative might put someone's nose out of joint. It can't be avoided. So many past grudges, unspoken insults, minor tiffs and veiled insults will culminate and fester. Add to this the vast amounts of sugar consumed (because while there is a sensible amount of salad and cold cuts on offer, we're really about the desserts. Tables are groaning under the weight of cakes and tarts and pies and buns - and they have to be eaten, we are told, because they will only go off and have to be thrown out. Which is almost as bad as having not enough food, but only just) and you have a recipe for disaster. Someone on a sugar high might take offence at - well, anything really. Eyebrows would be raised. Noses would be sniffed. Chins would be jutted. No one would actually say anything because you wouldn't want to make a fuss, would you? Instead you could just take your grudge home, wrapped tightly like your leftovers, ready to be re-heated the next day. The first people start to leave and parents go out into the garden to gather up their kiddies. At this point, I seem to remember it taking on a kind of Lord of the Flies aura: children in rags, with berry-based warpaint smeared across their faces, armed with spears and sticks. Then again, memory might be tricking me, but I think that's kind of the direction it took. Mothers and fathers would have to dip into a mass of children and extract the one closest in age to their own and hope they'd get lucky - if not, keep trying till you'd collar your offspring. Then you actually had to say your goodbyes and gather the entire family as well as the entire family's coats, handbags, shoes (they often got discarded along the way), and sundry random items of clothing such as jumpers or socks that were tossed somewhere mid-afternoon. So you could easily factor in another hour - and if you were smart, you'd wait till your mother was caught up in another conversation and slip away gleefully down the garden till she came back for you herself or sent some sibling lackey to do her dirty work. Once home, we'd be tossed into our pyjamas. The smaller ones would already be fast asleep, exhausted and overwrought. My parents would send us to bed, hoping for an easy night but would end up in and out to our bedrooms, soothing tummy aches or nightmares, escorting children to the bathroom to wee or throw up the seven pounds of crisps and licorice they managed to scoff over the course of the day. "Never again!" my father would declare. "Enough of that now, for a while!" The eejit. Sure, only a week later there'd be someone's christening and we'd have to do the whole thing over again. 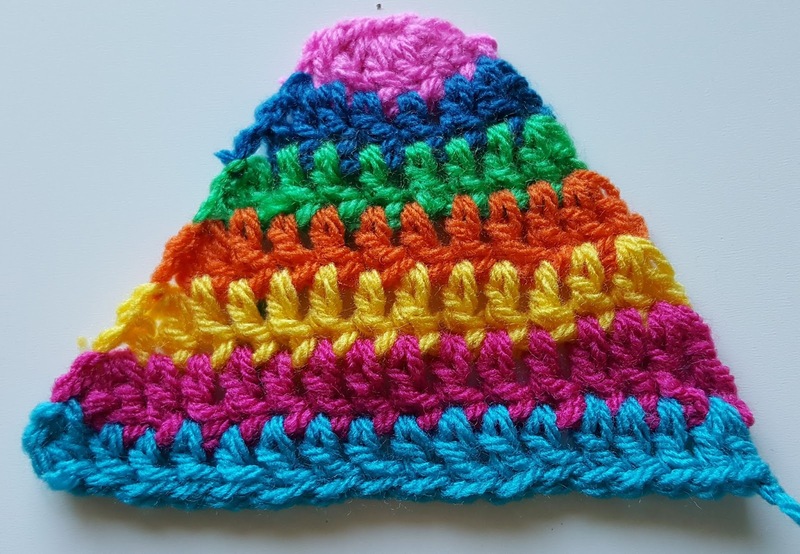 If you would like to download a PDF of this pattern, please click HERE! · Gauge: not important. 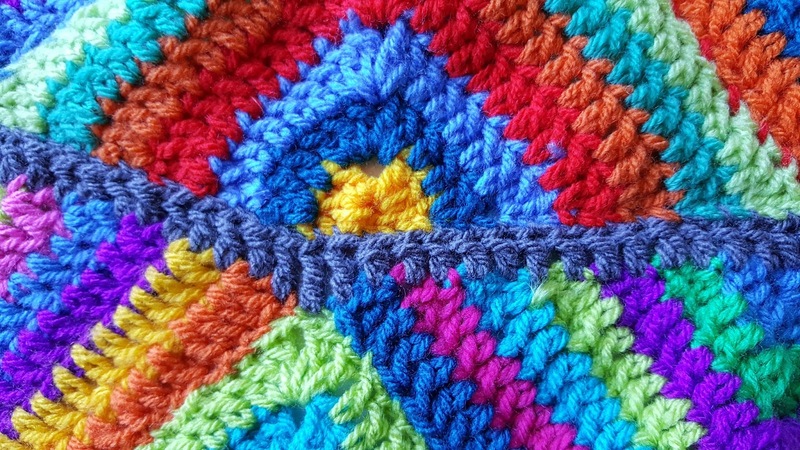 Make your blanket as long or as short as you like, make your triangles bigger or smaller by adding more rows or crocheting fewer. 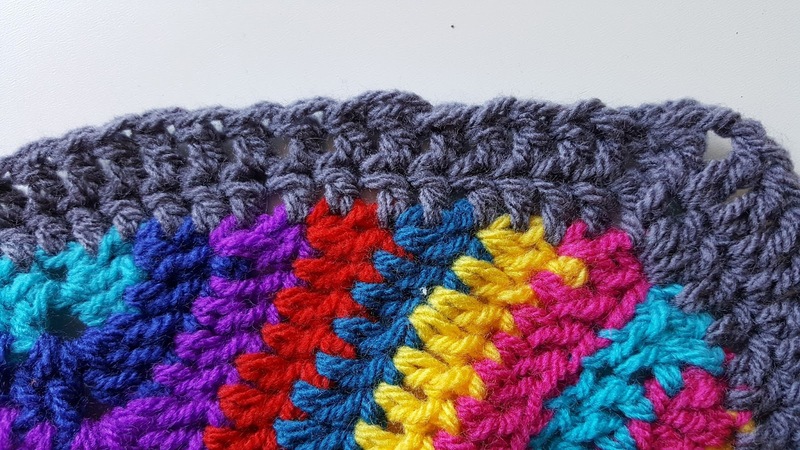 · Yarn quantity: as this is a scrap blanket, no exact quantities can be given. However, my experience has been that a full sized (generous single bed / a cover for a standard double bed) requires about 15 balls of worsted weight yarn (e.g. RHSS), approx. 4 of which are the ‘main colour’ (here: dark grey). Your mileage may vary, depending on the size of your blanket, your hook size and how tightly/loosely you crochet. Rd. 1 Into ring: ch 3, 2DC, ch 2. Join new color after this and every other round. 1 DC in each stitch till the last. 2 DC in last stitch. When you have seven rows (or larger, as you wish), cut yarn and weave in end. 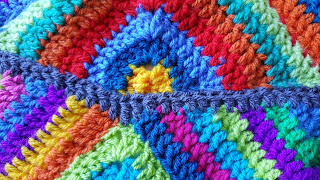 Place the triangles as shown in the photo below and whipstitch them together. 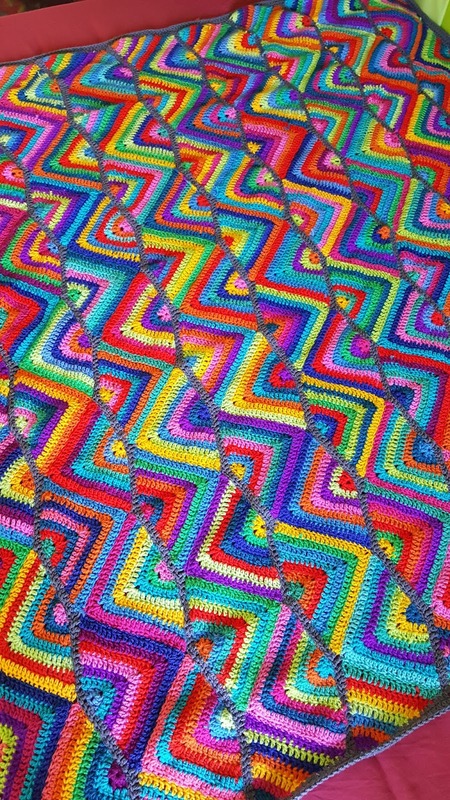 I sewed 13 triangles together per strip. In order to get a straighter edge, I created a triangle half the size of the others and sewed it in place at the end of each strip. 2 DC in last stitch. How do I join the strips? 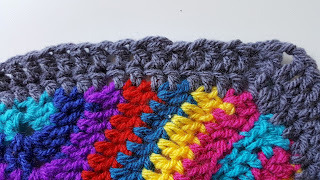 You can, of course, simply sew them together, but I wanted to create a clearer zigzag pattern, so I crocheted a line of DC [TR]s across one side of each strip in the main color (here: dark grey), then sewed this grey edge to the next strip. 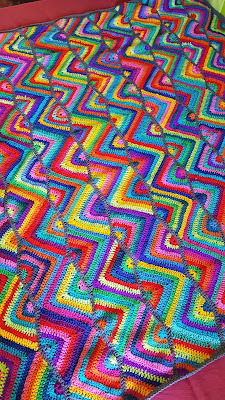 This created a ‘line’ between the busy colors and emphasized the colorful zigzags. 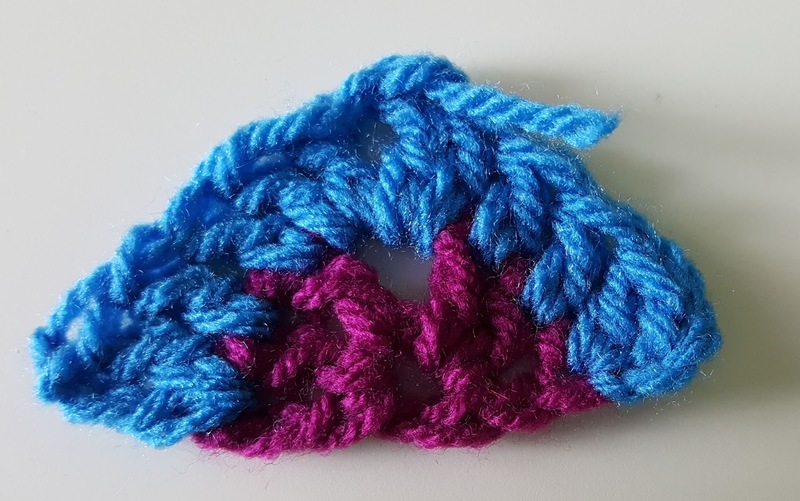 As a rule of thumb, I crocheted 2 DC [TR]s into the (sideways) DC [TR]s along the sides of the triangles. Sometimes I used into the top of a triangle (here, for example, into the top of the green one), if the crocheted strip dipped a little too much. 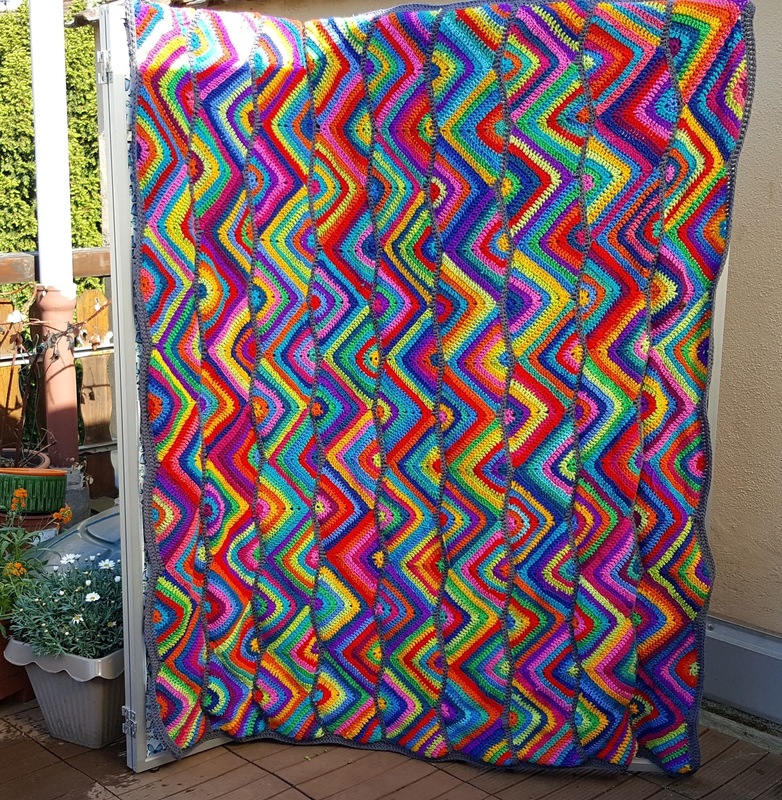 How do I edge the blanket? 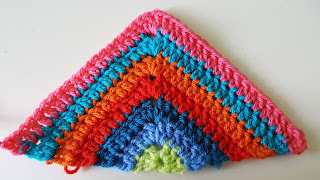 I crocheted enough strips of triangles to make the blanket roughly square, though you, of course, could crochet longer strips of triangles and make your blanket a rectangular shape. When all of the strips were sewn together, I just crocheted two rounds of DC [TR]s in the main color, grey, with 1 DC [TR]+ 2 ch + 1 DC [TR] in each corner.